This circuit makes it possible to do something that was previously unthinkable: reversing the effects of sulphation in tired lead-acid batteries. 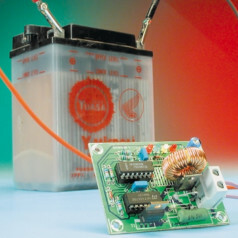 The circuit is also recommended for use as a conditioner for new batteries.In a recent scientific journal it was stated that 80% of lead-acid batteries eventually fail due to sulphation. This sulphation occurs due to general old age, non-ideal charge/discharge cycles or storage in a discharged state for too long. The last happens often with batteries in motorbikes and classic cars, since these have an enforced rest during the winter months. To counter this, Elektor Electronics has designed a special charger a couple of years ago, which keeps the batteries in good condition during their winter sleep.